Before embarking on yet another exciting journey in 2011, I would like to take a moment and reflect on some of the memorable books I’ve read in 2010. Survey from The Perpetual Page-Turner. I believe that I read more books this year than I did in 2009. Some of them are good, while some of them – well – not just my cup of tea. But this question is a tough one. Quite a number of them to choose from but the one book that made the biggest impression on me was Kate Morton’s The Forgotten Garden, which I discovered a few months ago, almost by chance, really. The story was so engaging that I finished the 600-plus-page book in just a few days. I attempted to read a few books but I had to abandon them after a few pages/chapter: Angela’s Ashes by Frank McCourt; Captain Corelli’s Mandolin by Louis de Bernières and Possession by A.S. Byatt. I know that these are very good books (classic, if I may say so), but I just felt that they are too big a novel for me. The Swan Thieves by Elizabeth Kostova. Well, my expectation for the book was rather high, considering that I love The Historian immensely. It was kind of a let down for me. So did Nicole Krauss’ Man Walks into a Room. 4. Most Surprising (in a good way) Book of 2010? Paul Auster’s The Book of Illusions. My first Paul Auster book. Reminds me of Carlos Ruiz Zafon’s The Shadow of the Wind because the stories are about books. It’s a suspenseful dark novel, rather eccentric story line (but in a good way), with twists and turns but not without humor and lyrical prose. It’s a book about loss and grief and how a person rise to overcome them. And who doesn’t love to read books about books? 5. Book You Recommended To Most People? 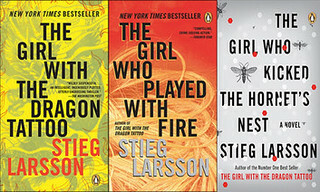 Definitely Stieg Larsson’s 3-book thriller: The Girl with the Dragon Tattoo, The Girl Who Played with Fire & The Girl Who Kicked the Hornet’s Nest. Read it! 6. Best Series Discovered in 2010? 7. Favorite New Authors You Discovered? I read a lot of these authors this year: Paul Auster, Agatha Christie & Jeffrey Archer. I wouldn’t call Jonathan Safran Foer’s Extremely Loud and Incredibly Close a hilarious read because the book really has deep meaning behind the humor. But there were definitely some cute moments that put a smile on my face. And Nora Ephron’s optimistic view on her divorce with her philandering husband in Heartburn is quite hilarious (of course, in hindsight, you can see things so much clearer…). 9. Most Thrilling, Unputdownable Book? Stieg Larsson’s series. Kane and Abel by Jeffrey Archer. The Forgotten Garden by Kate Morton. The Debutante by Kathleen Tessaro. I know I should have picked only one, but I can’t decide!! 10. Book You Most Anticipated? 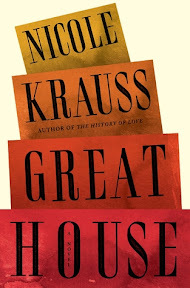 Paul Auster’s Sunset Park and Nicole Krauss’ Great House. Lisbeth Salander, the girl with the dragon tattoo. Definitely, a really cool girl she is. And seeing her on film (the Swedish version) makes her more memorable to me. Can’t wait to watch the US version in 2011. 13. Most Beautifully Written Book? The History of Love by Nicole Krauss. I savor every word. Nice storyline too. 14. Book That Had the Greatest Impact? Personally, So Many Books, So Little Time by Sara Nelson is something that I can relate with. It is always nice to “meet” somebody who shares the same passion as you do, to read her thoughts and say, “Yeah, I feel that way too! !” – only, she has maybe thousands of books on her wall-to-wall shelf, where I, on the other hand, can only dream (someday.. someday..). 15. Book You Can't Believe You Waited Until 2010 To Read? Kane and Abel by Jeffrey Archer. Agatha Christie’s. 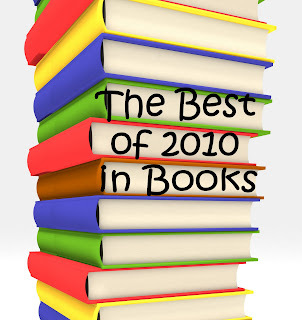 Looking forward to more and more exciting books in 2011!!! hi, nice blog you have there. looking forward to reading more from you! Cool site1 I love your library, very nice selections. 2) You chose Stieg Larsson's trilogy to recommend to most people: can I ask why? I read the first one, but it did not leave a lasting impression on me. I'd like to compare notes, maybe I missed something. 4) I followed your site from Book Blogs. I really like it so I'm adding you to my blogroll. Can't wait to read your reviews! hi liveliest, thanks for dropping by my blog. 1) I think you would enjoy The Forgotten Garden thoroughly. I think Kate Morton's fantastic too. That's why I have included The House at Riverton and Kate Morton's latest novel, The Distant Hours in my TBR list. 2) Perhaps my natural inkling towards thriller and fast-paced suspense novel made me enjoy Stieg Larsson's trilogy so much. I took a while before reading the first book, because frankly, the book did not seem to me like something I would usually like, but when I heard that the movie is coming out soon, it made me curious and I'm someone who usually would read the book first before watching the movie. In the end, I enjoyed it because after every page I read, I want to know more and more. 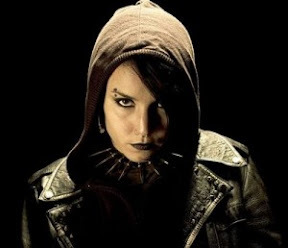 3) Lisbeth Salander's character strikes to me because I think there are not many female heroines in a thriller. She is eccentric, tough, smart, a computer hacker (i work in IT) .. I think she's unique. It is always exciting to get to know another Malaysian in this community. I've to admit that I haven't really read any of the books you listed on this list but you did give me some ideas on what books to look forward to this year. Thank you for following my blog. I'll be visiting again to read more reviews from you. And last but not least, happy new year. I just started reading Great House... it's a little strange for me so far, but I really liked The History of Love.